Celeste, 26, is a Honduran feminist. 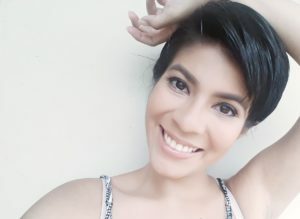 She has a degree in Social Work from the National Autonomous University of Honduras (UNAH) and is an activist for the right to freedom of expression and women’s rights. She is also a researcher on sexual rights, reproductive rights, the right to freedom of expression and the protection of human rights defenders. At the Committee for Free Expression (C-Libre) she has been the Coordinator of Management and Advocacy since June 2016. She designs, monitors and implements projects, promotes international alliances and political advocacy, and advises on issues related to gender, feminism and digital rights. – Copywriter of the report “The Sexual and Reproductive Rights Agenda for Women, Youth and the LGTBI community in Honduras. Context and mapping of actors, Red de Salud de las Mujeres Latinoamericanas y del Caribe RSMLAC. – Copywriter of the Civil Society Country Report on the progress and setbacks of the Montevideo Consensus on Population and Development for UNFPA. She worked with UNDP, and UNVolunteers on the Project “Citizen Livelihood and Security,” giving workshops on culture of peace and violence prevention to youth and adolescents in Comayagua, Cortés, Atlántida and Francisco Morazán, Honduras. She also worked for UNICEF as a collaborator in a research project on the conditions of poverty among children in municipalities with high poverty rates in Choluteca. Her experience also includes a position at OXFAM as an academic researcher in a study on the impact of violence and insecurity on women in vulnerable neighborhoods.